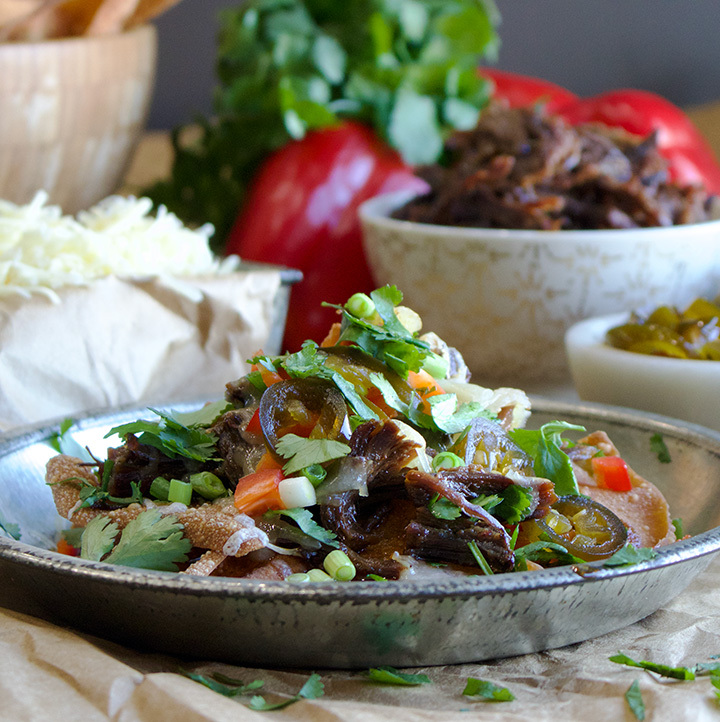 Asian Short Rib Nachos with Fried Wonton Chips. 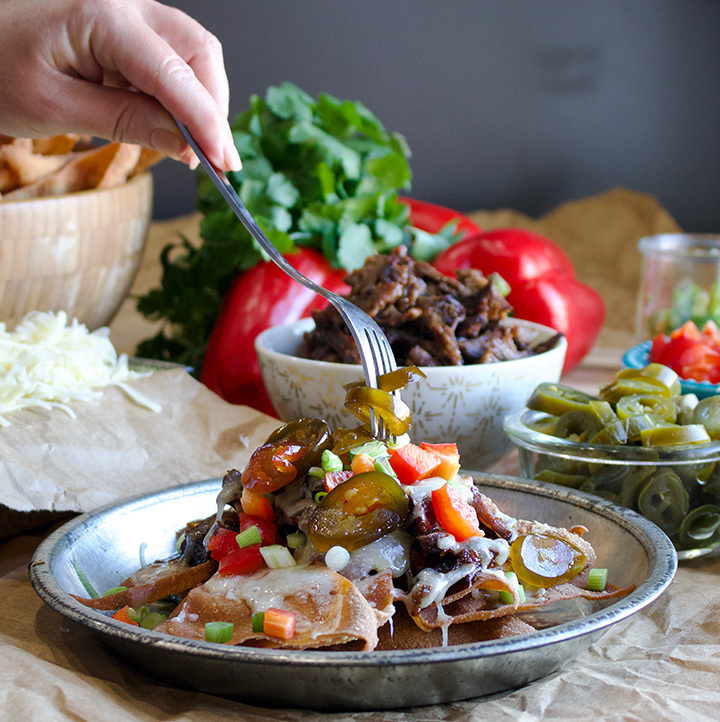 Crispy wonton chips are loaded up with falling apart tender slow cooked Asian short ribs, melted white cheddar cheese, red bell peppers, scallions, jalapeños and cilantro. 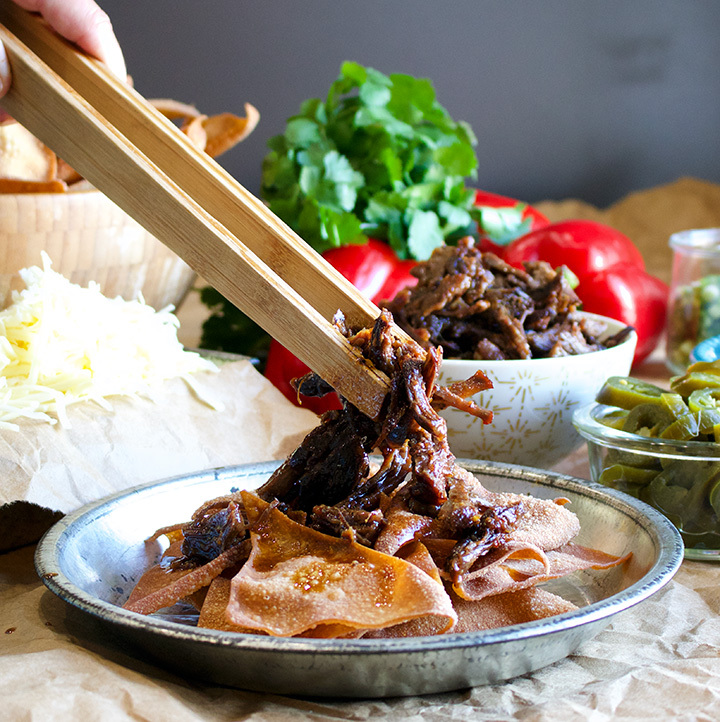 Slow cooker Asian short ribs are my latest obsession. I’ve been making them on the regular and putting the meat in everything – lasagna, rice bowls, pasta, sandwiches, omelettes, tacos – and nachos. The meat is meltingly tender and packed with flavor. Yes, short ribs are on the pricy side. But, they are so rich that you can get away with a much smaller amount of meat per person than most other cuts. Cooking short ribs in the slow cooker is the way to go. The long cooking time renders the meat so tender it literally falls off the bone and the sauce gets all rich and velvety. When possible, I like to cook the short ribs at least 1 day in advance, separating the meat from the sauce and storing both in the refrigerator. This allows the excess fat to separate from the sauce so that you can easily scoop it off. Short ribs are on the fatty side, and having too much fat in the sauce makes them overly rich. If cooking the meat in advance doesn’t suit you, just let the sauce sit undisturbed for 10 or 15 minutes, then skim as much of it from the top as you can. Because the meat is drenched in sauce, it will keep warm for hours in the slow cooker without drying out, making it PERFECT for entertaining. I am a “do ahead” kind of hostess. When I host a party – regardless of whether we’re expecting 100 people or 5 – everything on the menu (mostly) must lend itself to advance preparation. We’ve hosted large graduation parties, dinner parties for 30, brunch for 50, and everything in between. Whatever the occasion, I don’t want to be stressed out or stuck in the kitchen for the whole party. Food for a party should be somewhat adaptable to personal tastes and dietary needs. I always make too much, so leftovers must freeze well. If it’s for an open house type of party, where people will be coming and going over the course of a few hours, I want the food to be something that can either be kept warm for hours, or can be reheated in small amounts as needed. 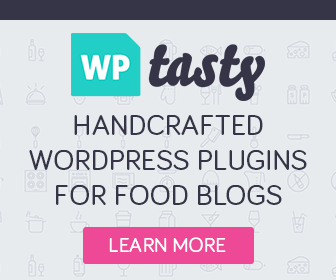 Finally, the recipe(s) must be easy to scale up or down depending on the number of expected guests. 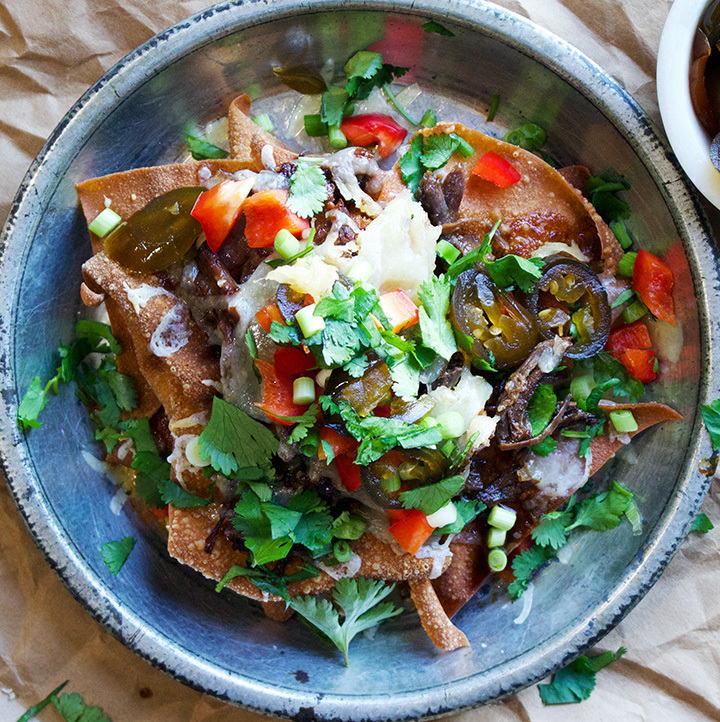 These Asian Short Rib Nachos are checking all those boxes for me. Making chips with wonton wrappers is a revelation to me. 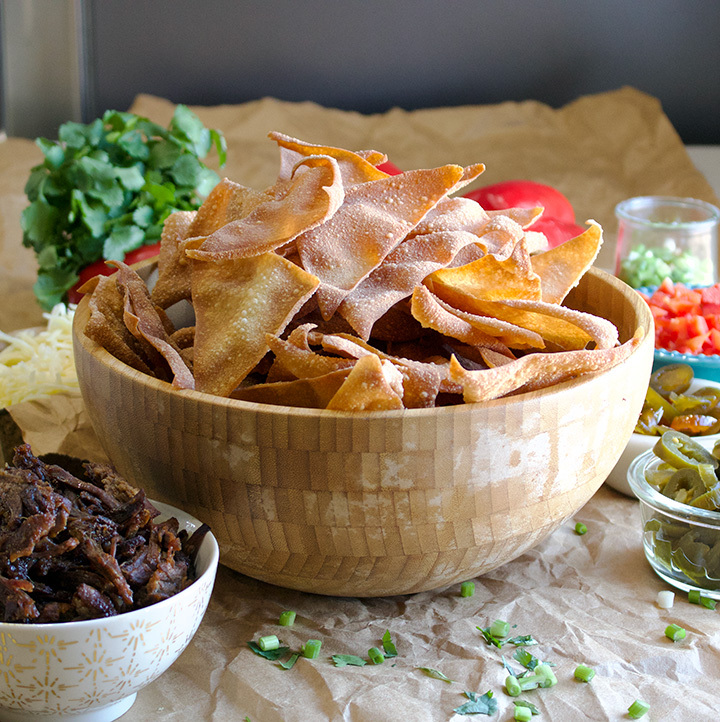 They are lighter and crisper than tortilla chips and, dare I say, more flavorful. They cook super quick – only a few seconds per chip – and don’t even need to be sprinkled with salt. Even better, kept in an airtight container, they’ll keep for several days before going stale. What is a nacho bar without plenty of options for piling on? This recipe calls for sharp white cheddar cheese, diced red pepper, scallions, cilantro, and pickled jalapeños. If you can find candied jalapeños, which are both sweet and spicy and complement the meat exceptionally well, all the better. I like to put out 2 or 3 different types of pickled jalapeños ranging from mild to spicy, and let everyone pick their own poison. If you want to go crazy with the toppings, consider sautéed mushrooms, pickled onions, or very thinly sliced radishes. 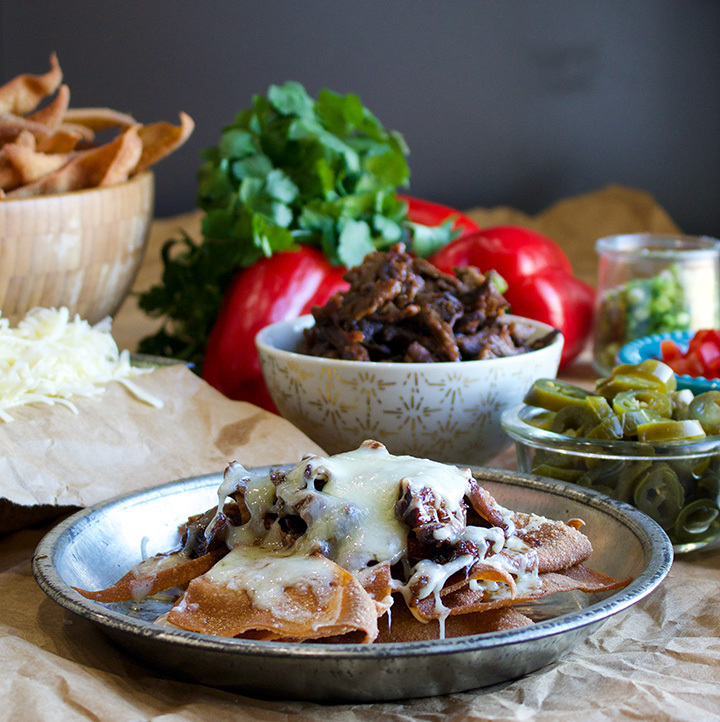 Let me just whisper a suggestion in your ear… Asian Short Rib Nachos would be PERFECT for Super Bowl Sunday. PERFECT. Like, who-cares-about-the-game-because-the-food-is-so-good-we-can’t-be-bothered-to-care kind of good. Ok. If you’re a big football fan, that’s probably taking it a bit too far. But, still. 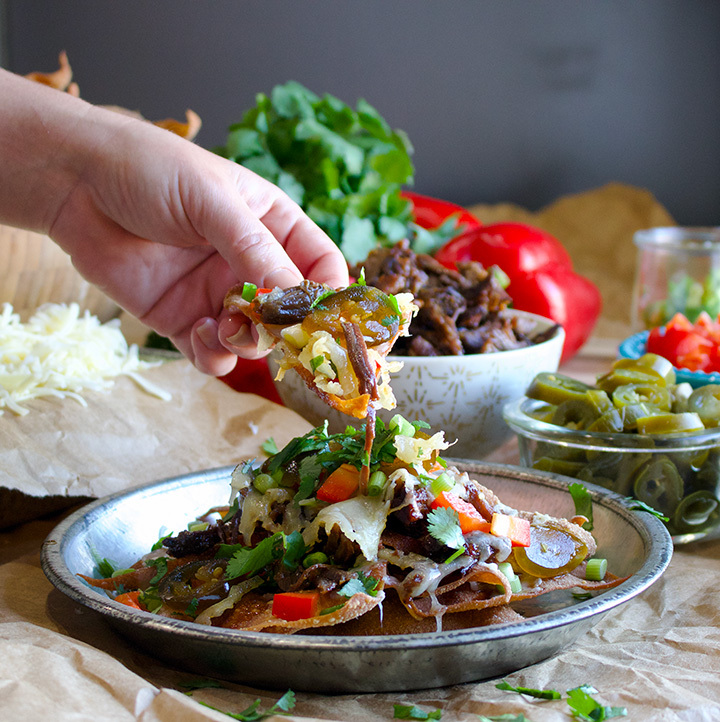 These nachos are so good they’ll at least offer super fans a moment of distraction. If you are thinking of making these for a Super Bowl party, you should probably “test” the recipe at least once before then. Probably more than once. You know… for research. 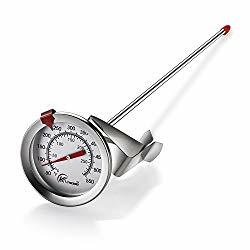 It’s really useful when frying anything to have a deep fry/ candy thermometer. If you’re oil is too hot, the wonton chips will burn. If it’s too cool, the wonton chips will absorb too much of the oil while the cook, resulting in greasy, somewhat soggy chips. About 2 cups vegetable oil. Lay the short ribs out on a paper towel and press another paper towel over them on all sides to absorb excess moisture. Sprinkle them generously on all sides with salt. Heat oil in a large, heavy bottom saucepan or dutch oven over medium-high heat until the oil is shimmering and just under the smoking point. Working with 4 or 5 pieces at a time, place the short ribs in the hot oil. Let them cook in the hot oil without moving them for about 1 minute. Turn the pieces in the hot oil, allowing them to brown on all sides. Remover the short ribs from the saucepan and place in the bowl of a slow cooker. Repeat with the remaining short rib pieces. Add the soy sauce, broth, brown sugar, ginger, sesame oil, and chili garlic sauce to a bowl and whisk to combine. Pour the mixture over the short ribs in the slow cooker. Cook the short ribs until the meat is so tender it’s falling off the bone, about 5 hours on high or 7-8 on low. If possible, stir the meat in the sauce halfway through cooking. Use tongs to remove meat from the slow cooker to a plate or cutting board and let sit until cool enough to handle. 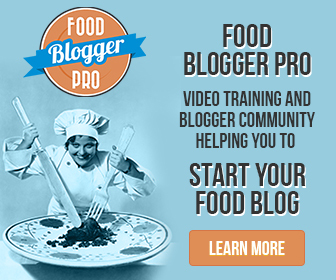 Strain the cooking liquid into a bowl; discard any solids left in the strainer. Let the sauce sit undisturbed for 5-10 minutes than skim as much excess fat from the top of the liquid as possible, discarding the fat. *If possible, put the cooking liquid into the refrigerator, uncovered, for an hour or two (or, covered, for up to 2 days). This will allow the excess fat in the liquid to harden across the top of the liquid, making it very easy to remove. Pour the cooking liquid into a saucepan and set it over medium high heat. Bring to a boil, then reduce the heat to medium and let simmer for about 15 minutes, until it’s reduced to about 1 & 1/2 cups. Meanwhile, pull the short rib meat from the bones and shred it into strips; discard bones and any pieces that are super fatty. Combine the shredded short rib meat with the sauce, stirring to coat the meat in the sauce. *Refrigerate the meat and sauce in a covered container in the refrigerator for up to 3 days. 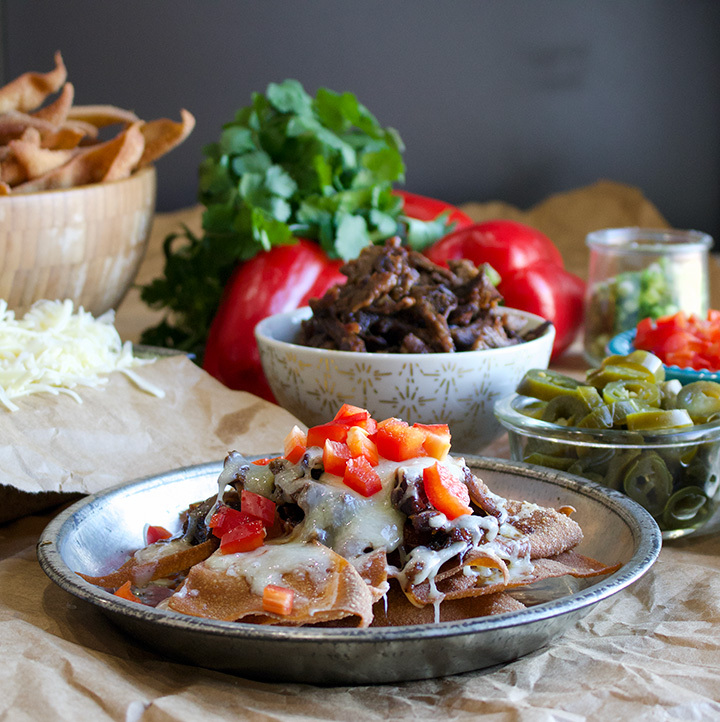 Put the meat and sauce back into the slow cooker about 1 hour before you plan to serve the nachos. Put the heat to low until the meat is heated through, then turn it down to warm. This will allow you to keep the meat warm for a couple of hours. Cut the wonton wrappers in half, diagonally, into triangles. They will stick together slightly, so take a few minutes to separate them, spreading them out on your counter (it’s fine if they overlap). They cook quickly; separating them now will make it easier to quickly grab a few to put in the hot oil. Pour enough oil into a heavy bottom saucepan to come 1-2 inches up the side of the pan and set it over high heat. Heat the oil to 325 degrees. As you cook the chips, do your best to keep the oil between 325 and 340 degrees. Set a baking sheet that’s been covered with a double layer of paper towels nearby. Use metal tongs to lower a few chips – 4 or 5 – into the hot oil. As they cook, flip them over so that they brown evenly on all sides. Cook them just until they are golden, then use the tongs to lift them from the hot oil to drain on the paper towel lined baking sheet. They will cook very quickly, so watch carefully. Repeat with remaining wontons. Store wonton chips in an airtight container until ready to serve. Remove the stem and seeds from the bell peppers, dice, and put into a bowl. Thinly slice the white and light green parts of the green onion and put them into a separate bowl. Coarsely chop the cilantro and put it into a bowl. 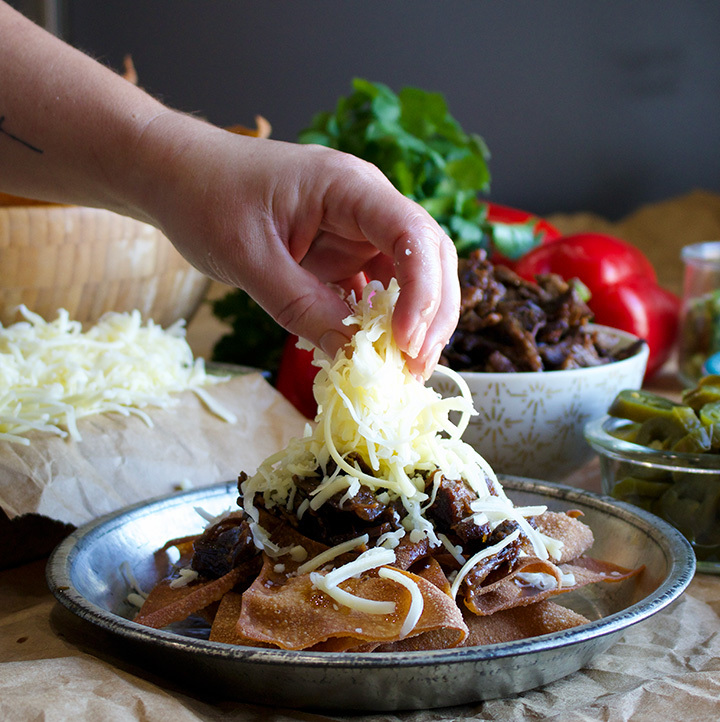 To serve: Pile the cheese and wonton chips into separate bowls and place next to the slow cooker containing the warm meat. Set the bowls of red peppers, green onions, and cilantro close by. Open the jar(s) of jalapeños and set out with small forks. 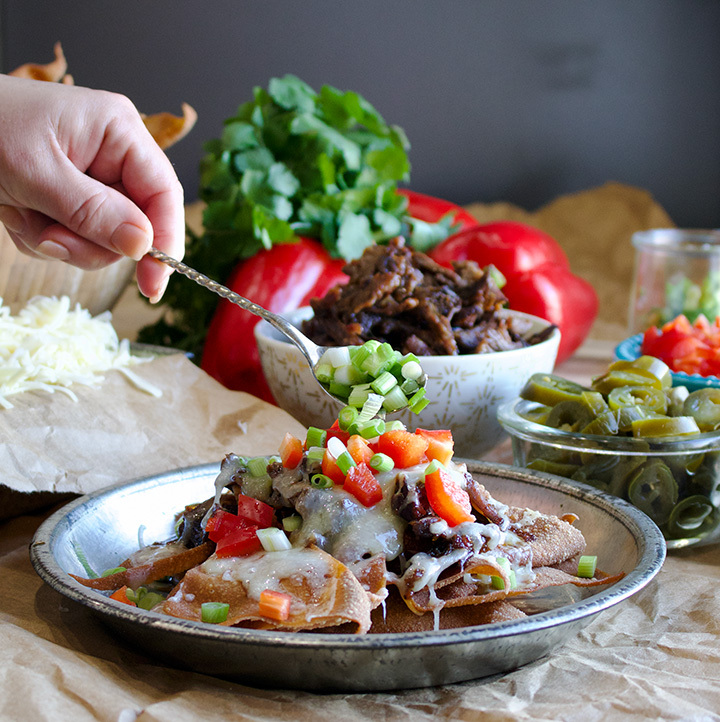 Let each guest assemble their nachos – heating the plates of meat and cheese in the microwave or preheated oven for a minute or two to melt the cheese before adding the rest of the toppings. One 14-oz package of wonton wrappers will give you about 104 chips. This is enough for 12 people to have about 8 chips each. Scale up if you think you might want more. 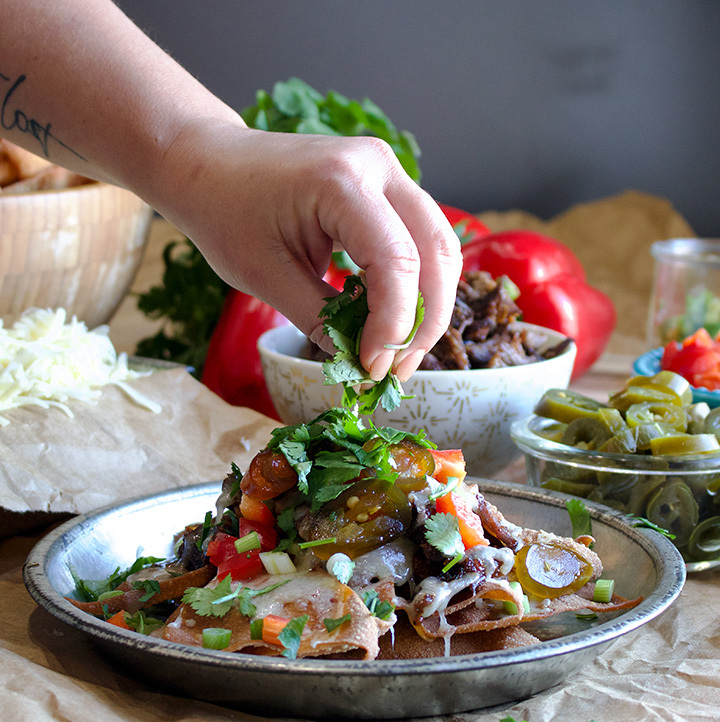 If you’re just making these for your family, not for a group of 12 people, consider making the entire recipe of short ribs and then cut the rest of the nacho ingredients in half. 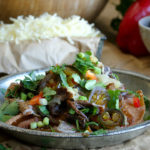 The short rib meat is crazy good and leftovers can be used to make Short Rib Pasta, Short Rib Rice and Veggie Bowls, or Short Rib Lasagna. The meat also freezes well (freeze it in some sauce) for up to 3 months.